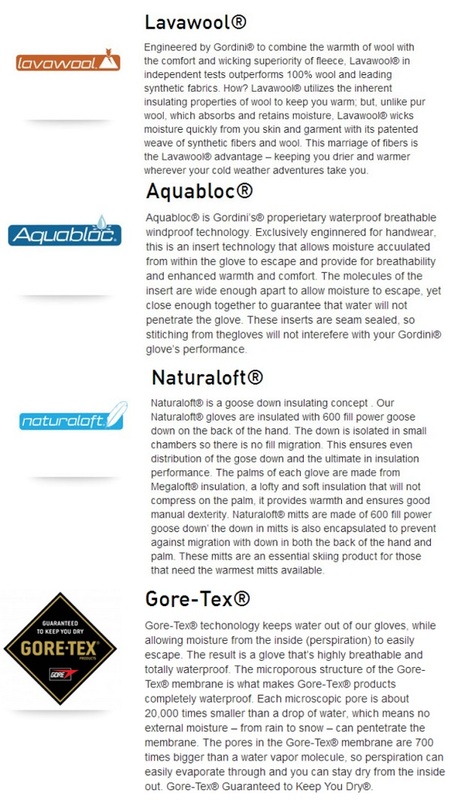 Gordini's Fuse Glove is one of the more technically engineered gloves. It features a 3 layer thermal ply waterproof, windproof, breathable fabric with goatskin leather and mini ripstop trim. Goatskin leather fingers, thumb and wrap caps and a circle flex palm. It has an Aquabloc ultra breathable, waterproof, windproof insert; the Lavawool moisture management system lining; fused zipper pocket; gauntlet cinch closure and leash. One of the best for keeping you warm! 3 layer thermal ply waterproof, windproof, breathable fabric with goatskin leather and mini ripstop trim. Goatskin leather fingers, thumb, and wrap caps with circle flex palm. Megaloft® with Lavawool® moisture management system lining and ultra breathable, waterproof, windproof Aquabloc ® insert. Aquabloc®, Lavawool®, Megaloft®, fused zipper pocket, gauntlet cinch closure, elastic leash, wrap caps, palm and thumb reinforcement.